About 25 students have been injured in clashes in Bangladesh's capital on the seventh day of a youth protest about road safety, reports say. Thousands of pupils have been out on Dhaka's roads stopping traffic and checking vehicles and drivers. It is not clear who attacked them but local media blamed a student group linked to the ruling party. [post_ads]The protesters want improved road safety after a boy and girl were killed by a speeding bus last Sunday. The government has blocked mobile internet access for 24 hours in response to the protests. Transport workers have in recent days staged their own strike, while the government has urged students to return to their classrooms. A government minister previously accused the students of hypocrisy, sparking further uproar. He later apologised. Reports said police used tear gas and rubber bullets as they tried to control the crowds on Saturday, though police denied this. A doctor and witnesses quoted by AFP news agency said the number of injured was much higher, at more than 100. Doctor Abdus Shabbir told the agency a few of the injured were "in a very bad condition" and some had rubber bullet injuries. 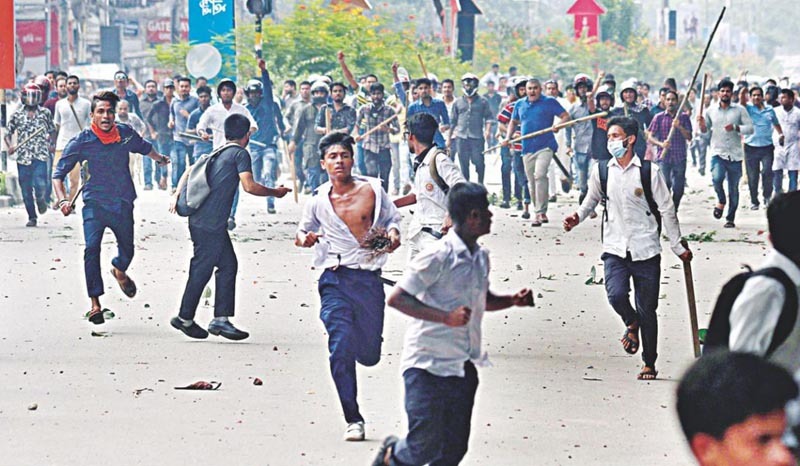 Local journalists told the BBC they were among those beaten up by members of the Bangladesh Chhatra League, a student organisation currently linked to the ruling Awami League and opposed to the protests. The journalists reported having their camera equipment destroyed. Amid reports of sexual assaults in the streets, a female reporter alleged on social media that she had been "molested" while trying to film the clashes. Chanting "We want justice", students have been calling for stricter enforcement of traffic laws, and have blocked major intersections in the capital for seven consecutive days. "We won't leave the roads until our demands are met. We want safe roads and safe drivers," said protester Al Miran to AFP news agency. Teens as young as 13 have been seen on Dhaka's notoriously clogged streets, checking drivers have valid licences and that cars and buses are in roadworthy conditions before letting them drive on.